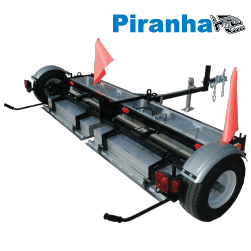 The Piranha is designed for cleaning large areas like airport runways and roads so it has some special features. 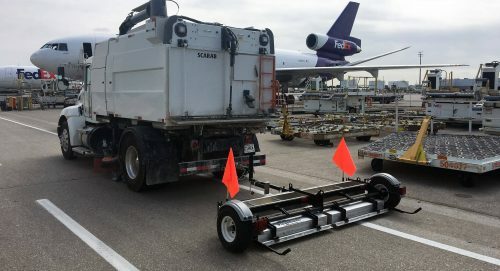 First of all, lots of power, to allow higher travel speeds while still picking up debris. 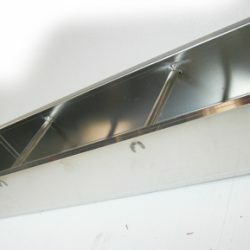 The unit has 2 rows of 4.5″ x 4.5″ magnetic housing. Each magnet housing has 3 layers of magnets packed end to end un-spaced with a metal backing plate to increase the size of the magnetic field and direct it downwards to increase pickup performance. It also has on board debris bins since when cleaning large areas, you could be a long way from home when you need to clean off the magnet. 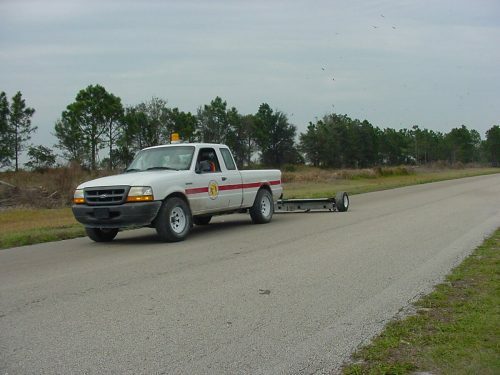 The tires are highway rated to allow you to pull the unit down the road from location to location. I am very impressed with the quality construction of the unit. 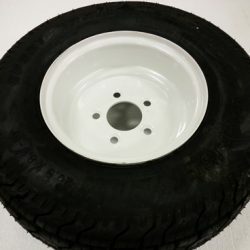 "We quickly discovered that the unit grabs cut-up pieces of steel belted radials that spill from our dump trucks as we carry them to the landfill site. In closing, what used to take four hours to accomplish with an ATV mounted magnet is now done in 30 minutes. 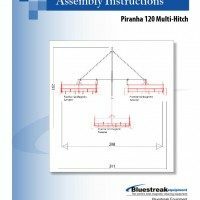 I highly recommend the Piranha120 to others for purchase. Its quality and performance is top notch." 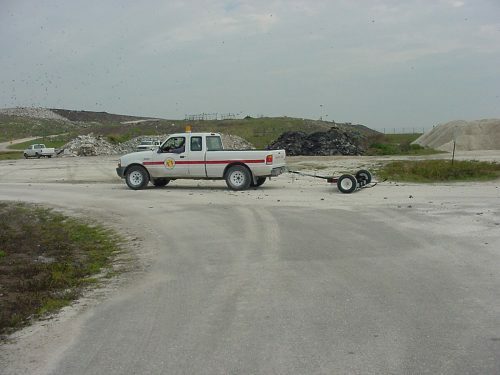 To sweep larger areas you need a magnet with power to travel faster. 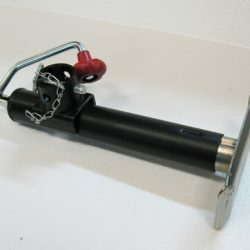 The Piranha has two rows of 4.5″ x 4.5″ magnetic housings giving it more magnetic pick up power so you can operate at higher speeds. 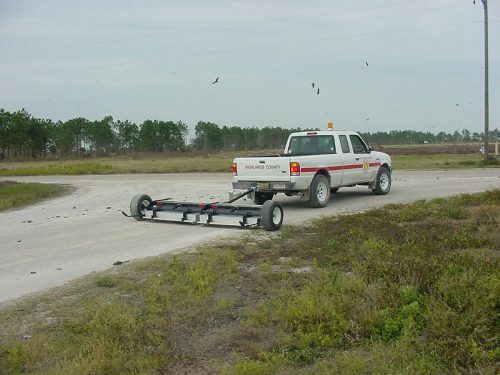 Picks up metal debris at operating speeds up to 15 mph/24kmp. Each of the 4.5″ x 4.5″ magnet housing has 3 layers of magnets packed end to end un-spaced with a metal backing plate to increase the size of the magnetic field and direct it downwards to increase pickup performance. 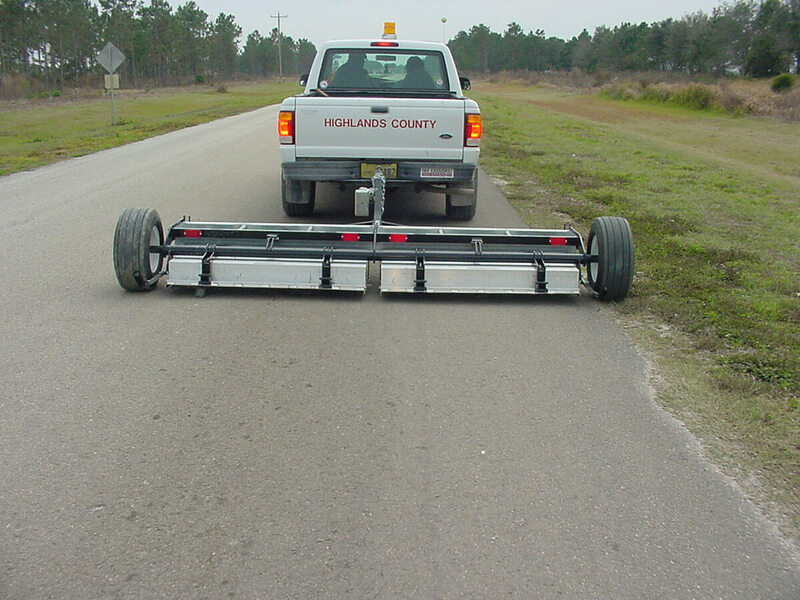 The unique Slingjaw clean off system makes removing debris from the tow behind sweeper fast and easy. 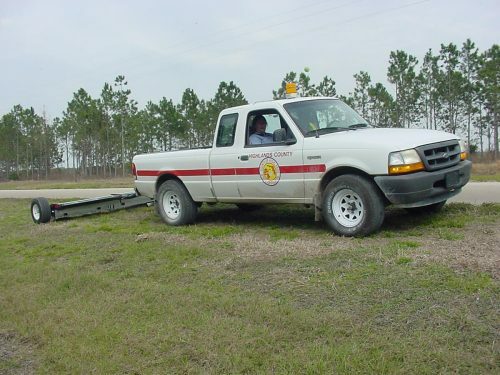 While the on board debris bins are large to stow the debris until you arrive back to your debris drop off location. Unique Slingjaw clean off system dumps debris into debris trays and holds it for later disposal. 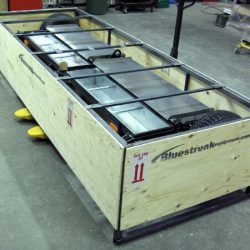 Removable on board storage bins allows you to store debris that is collected on the road and remove it later at the debris dumping location. 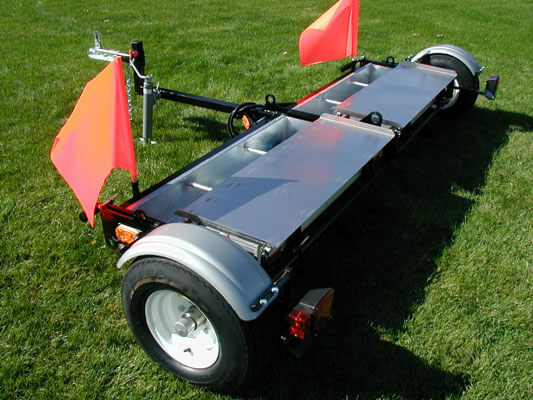 Larger 20.5″ x 8.5″ highway rated tires to allow you to pull the unit down the road from location to location. “Bearing Buddies” on both hubs ensure continuous lubrication and easy maintenance, just fill with grease occasionally. 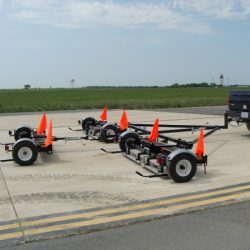 Add optional the optional “Lights and Fenders” package to the Piranha if you will be traveling on roads or in traffic conditions. The Piranha has a generous 7 inch ground clearance when the magnets are in the stowed traveling position and not being used. 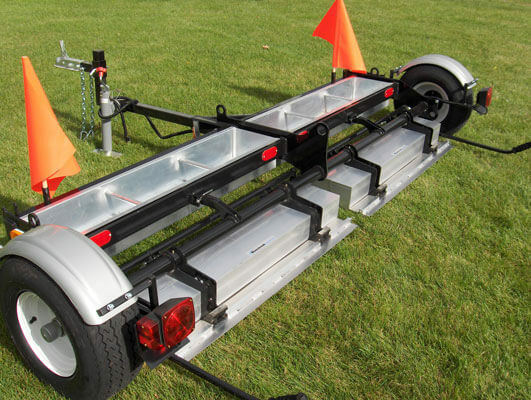 When the magnets are down and in use the ground clearance or sweeping height is 3 inches. When magnets are not in use they can be stored in a travel position. Here they are shown with one magnet in travel position and one magnet down ready to use. 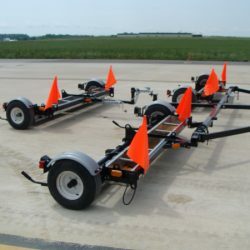 Capable of hitching 3 Piranha 120’s together to cover larger areas faster (see optional "Piranha 120 Multi-Hitch" accessory). Optional "Lights and Fenders" package to add lights and fenders to the Piranha. 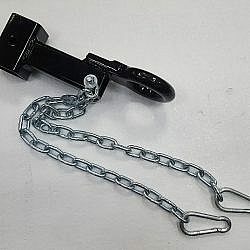 Optional "Pintle Hook" available to replace 2″ ball coupler. 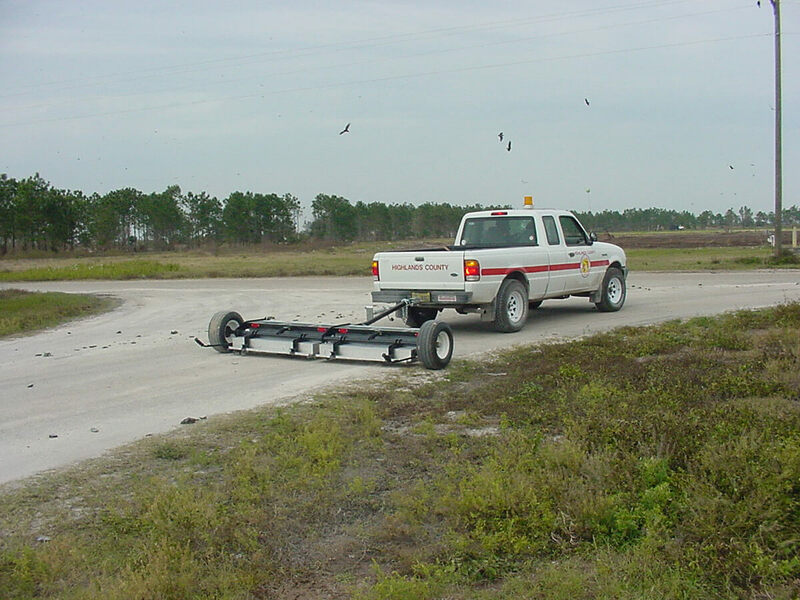 Picks up metal debris at operating speeds up to 15 mph/24kmp. 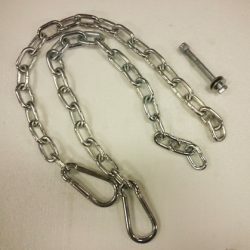 Maximum lifting height is 11” (using a two and a half inch nail). Fixed sweeping height of 3 inches. 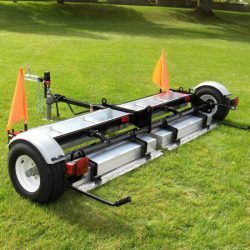 Adjustable hitch height to match any tow vehicle hitch height to ensure sweeper can be towed level for optimum performance. Cleaning Method Slingjaw clean off system. 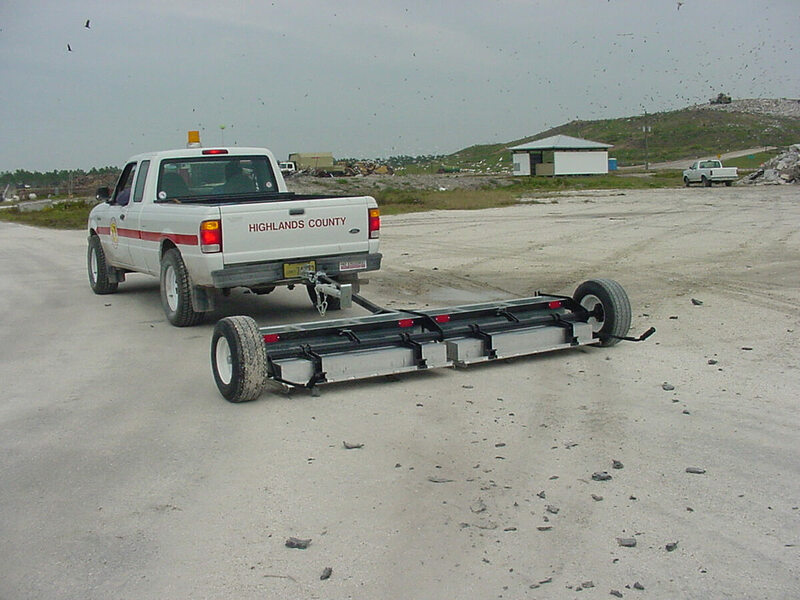 Magnetic housing rotates up side down, debris falls into debris holding tray. Slingjaw clean off system. Magnetic housing rotates up side down, debris falls into debris holding tray. Coupler Height Adjustment 2″ Ball with coupler heights of 16″, 18″, 20″ and 22″. 2″ Ball with coupler heights of 16″, 18″, 20″ and 22″. 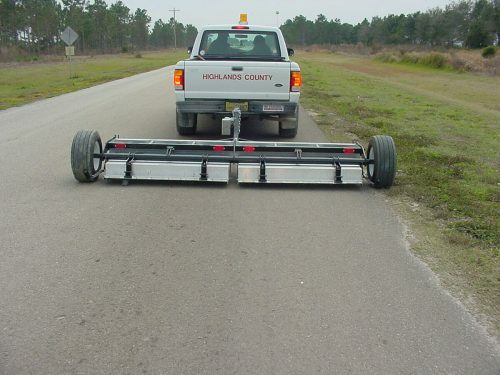 Height Adjustability 3″ clearance with sweepers down, 7 ” clearance when traveling with sweepers up and not in use. 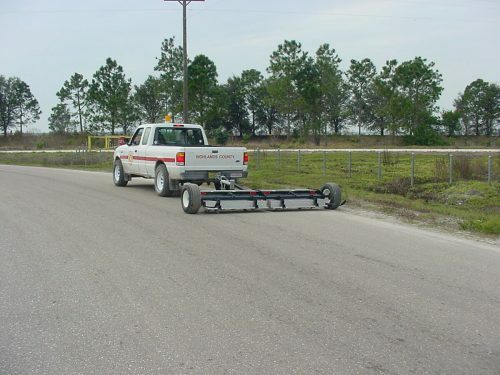 3″ clearance with sweepers down, 7 ” clearance when traveling with sweepers up and not in use. Wow. Not only does it look good, it sweeps FOD real good. Thanks from a satisfied customer. Just a note to tell you that I am very satisfied with the Piranha120 that I recently aquired for use at the Highlands County Solid Waste facility in Sebring, Florida. I am very impressed with the quality construction of the unit. It is heavy duty in all respects. 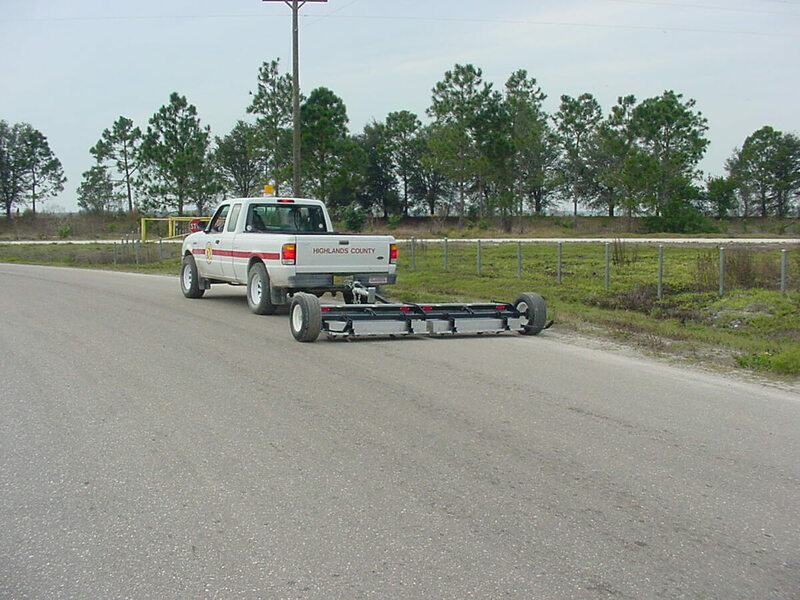 The unit performs very well, even in somewhat adverse conditions, such as pictured, where we not only sweep our roads, we also sweep along the sides. We quickly discovered that the unit grabs cut-up pieces of steel belted radials that spill from our dump trucks as we carry them to the landfill site. 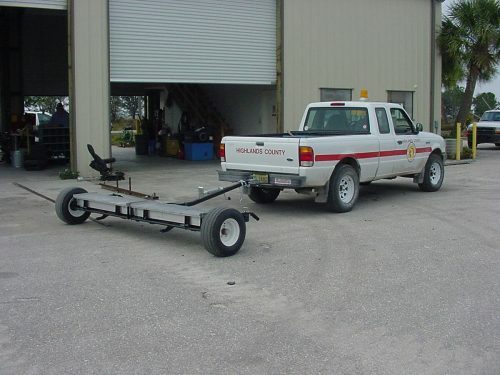 In closing, what used to take four hours to accomplish with an ATV mounted magnet is now done in 30 minutes. 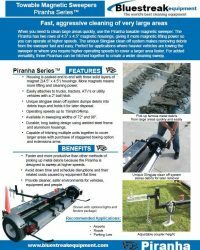 I highly recommend the Piranha120 to others for purchase. Its quality and performance is top notch.